A.J. Burnett used to enjoy the confines of pitching in the Rogers Centre. With a cushy 5 year/$55 million dollar contact under his belt in the city of Toronto, Burnett had it made in the shade. Then he opted out of the final three years of his contract and signed a contract with the mecca of all baseball teams, the New York Yankees. And he thought the media in Toronto was tough. As the Blue Jays chased A.J. Burnett in just the third inning, the Yankees had to put the champagne on ice for the evening. With the loss, that now makes Burnett’s record against his former team a lowly 1-4 in six starts with a 6.91 ERA since 2009. This is arguably the most unstable number two starter on a playoff bound team in recent memory, and yet the Yankees have the task of handing him the ball in game two of the ALDS. To further prove my point, according to STATS INC, A.J. Burnett is the first pitcher with a 15 loss season playing for a 93+ win team since Carlos Silva went 11-15 with the Twins in 2006. Despite the general tone of this post, I don’t have any bottled up disdain for A.J. Burnett whatsoever, it’s just that there’s something strangely satisfying about watching him crash and burn playing for the biggest franchise in all of sports. I honestly thought the novelty of Burnett coming back to pitch at the Rogers Centre would wear off after almost two full seasons of him in pinstripes, but it never seems to get old … even if every start isn’t as epic as Halladay vs. Burnett. As a side note, how amazing would it be to see a potential Halladay vs. Burnett 2.0 in the World Series? It’s a bit of a long shot at this point, but just entertain the idea for a brief moment. Like I said, if he thought things were tough in Toronto, now he’s under the bright lights in New York. It’s only a matter of time before there’s a New York Post front page story plastered with A.J. Burnett featuring some witty headline voicing displeasure with their $85 million dollar man. Food tastes better after watching the Jays clobber AJ Burnett. I like to tip my cap (if I am wearing one) whenever he gets the hook. 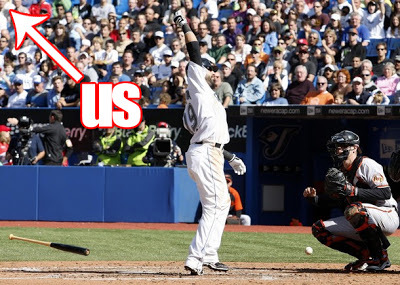 Matt, I think everything is better when the Jays clobber Burnett. I was afraid the Jays might give away that game in late innings, but luckily they held on. No clinching party on Monday, thankfully. Always nice to see the home team win and the Yankees lose. Nothing against Burnett indeed — if it were another team I'd probably feel pretty neutral about the whole thing, and if he'd stuck out his contract in T.O. (not that I'd expect anyone in the same position to have) I'd probably cheer him on with his new team. As it is, I'm happy to see his losses pile up and his ERA push toward double digits on both sides of the decimal. Hopefully the other team always wins and the Yanks are stuck with the bill. QJays, long time no see! I think even if Burnett stuck out his contract in Toronto and then went to the Yankees, the fans would still boo him. There's something about playing for the Evil Empire that turns a player into an enemy. You never want to be compared to Carlos Silva. Ever. And that opt-out in Burnett's contract with the Jays turned out to be pretty damn important, didn't it? Good times. Will be very interesting to see how A.J. fares in the post-season. Nav, initially I was a little disappointed that Burnett opted out, but now I'm happy that money is off the books. I'll take Morrow over Burnett any day of the week (and twice on Sundays).